What are the fundamental types of questions that humans ask? What are the fundamental types of answers that humans expect? Can we produce a table from these fundamental questions and answers? The ability to know, to have access to knowledge, is now measured not by IQ tests but by the network speed of your smart phone. Simply having knowledge is no longer the primary advantage. The primary advantage comes from asking the right question. This means that Knowledge is no longer the ultimate power. Questioning is power. Remember, Einstein said “Imagination is more important than knowledge.”​ Questioning Skills create the answers we call “knowledge.” What we know is intricately related to what we ask, and what we can ask. So study the questions first. Questions come from two forces: curiosity and conviction. For example, a question during an investigation of a suspect will either be “Where were you last night?” or “Isn’t it true that you were out last night?” Even the social forums we find ourselves within are based on whether our questions are coming from curiosity or from conviction. For example, the forum is called dialogue when the participants are asking questions from curiosity. But the forum is called groupthink when the participants are asking collaborative questions from conviction, and called debate when the participants are asking competitive questions from conviction. Questions come from three operations: conception, choice, and certainty. If I asked you to list all the things that you can do to a database record, you might say that you could add a name, add an address, update a phone number, etc. But there are really only a few basic operations that you can perform on a database record: create, update, read, and delete. Similarly, if I asked you to list all of the types of questions, you might provide a list like: who, what, where, when, why, how, which, etc. But these questions are not the innate question operations. The three most basic question operations are conception, choice, and certainty. Given this framework-question theory, which says that questions are derived from frameworks in three ways, and given that we ask these questions from curiosity or conviction, we find there are six (2x3) foundational question types. "We are all familiar with the term know-how, and it seems reasonable to conclude that this is a type of knowledge that was gained by asking the question “how?” This relationship between the basic types of knowledge and the basic types of questions can be found in the symbiotic table of knowledge. From a philosophy background, Descartes defined knowledge in terms of doubt. But Peirce said “We cannot begin with complete doubt. We must begin with all the prejudices which we actually have when we enter upon the study of philosophy.” So, if we recognize doubt as one of the six foundational question types, we can create the question side of the framework-question theory table. From an education background, Merrill classified the content from learning (knowledge) within his component display theory as facts, concepts, procedures, and principles. So, we can generalize these as answers which are concise, contextual, consequential, and conceptional. Finally, Gentner and Stevens described mental models as having the ability to infer between prescriptive and descriptive knowledge. 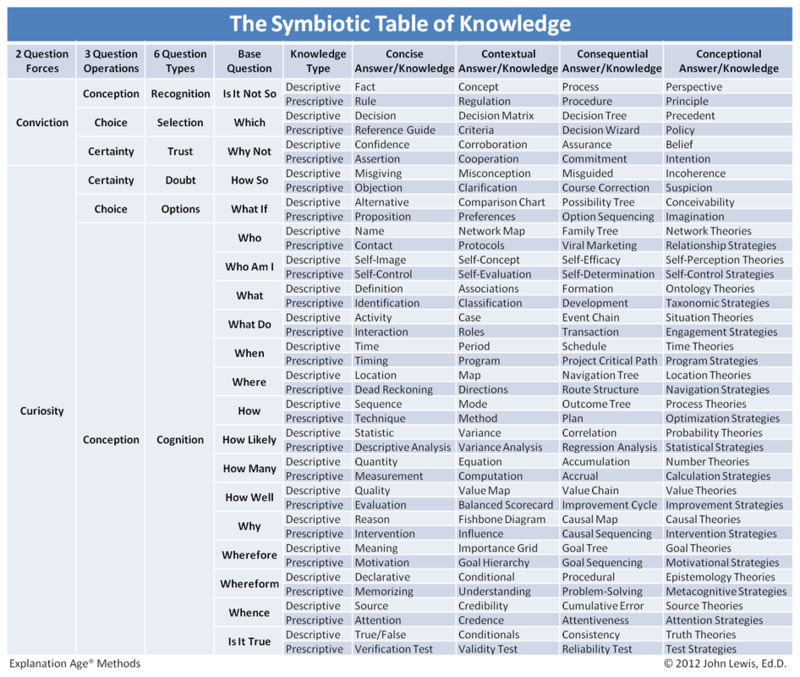 Combining these views of knowledge led to “The Symbiotic Table of Knowledge” which presents knowledge as answers to questions, but within an inference framework that also generates new questions."